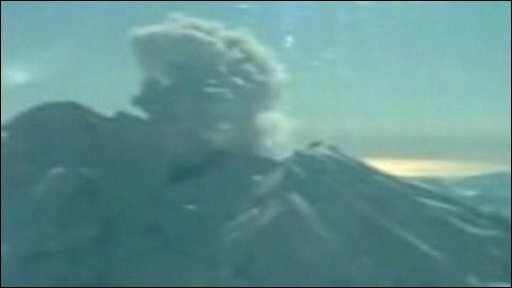 Mount Redoubt volcano in the US state of Alaska has erupted for the sixth time in 24 hours, spewing ash and steam 15km (9.3 miles) into the air. The volcano, 166km (103 miles) south-west of the state's biggest city, Anchorage, began erupting late on Sunday after a 20-year lull. Ash has fallen on towns north of Anchorage, but the city itself has not been affected by the eruption. 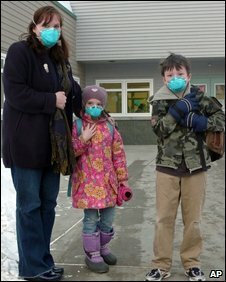 Alaskan Airlines has cancelled a number of flights because of the ash. Officials at the Alaska Volcano Observatory were able to monitor the latest eruption live via a webcam. "We were able to see mudflows, pyroclastic flows and a nice ash column shooting out of the summit," geologist Janet Schaefer told the BBC. "It was quite spectacular." Ms Schaefer said the ash, which can cause skin irritation and breathing problems, was so far not too dangerous for people living in the vicinity but was dangerous for air traffic. The ash can cause damage to jet engines. People with respiratory problems have been warned to stay indoors until the ash settles or to wear a face mask if they go outside. Ms Schaefer said the Observatory was working with the Federal Aviation Administration (FAA) and the National Weather Service to track ash clouds and ensure flights were diverted or cancelled if necessary. "If it is anything like the 1989 eruption, we could expect activity to continue for three to four months," Ms Schaefer said.